I love decorating my house for Christmas. I start after Thanksgiving and add a little bit each week until I get the house just the way I like it. My goal is for everything to look festive, beautiful, but also not overwhelming. We live in a small house—more of a cottage, really—so I like to keep our decorations relatively simple. 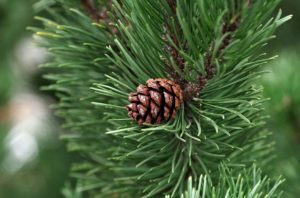 And since I love nature, I try to incorporate natural elements like wood, branches, berries, and more, into our Christmas décor. This keeps our decorating budget very low. And I like it because we don’t end up with a lot of things to store for the year, or plastic items that might break and then have to be thrown away. I hope you enjoy these unique and natural decorating ideas! I didn’t put this arrangement together, but it’s very similar to the things I like to create around Christmas. 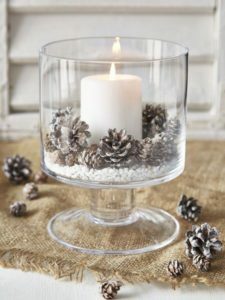 Simple pinecones around a candle create a gorgeous holiday ambiance. Or put the pinecones into a glass bowl. If you have a child, they’ll enjoy adding some white paint to the pinecones to create snow. Glitter makes sparkly snow! 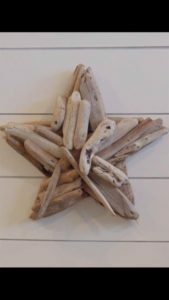 Pieces of wood, whether you find driftwood on the shore or sticks in the woods, can be turned into beautiful stars, trees, and other holiday shapes. We have all kinds of foods in our kitchens that, if arranged the right way, become festive. How about a bowl of red apples on the table? 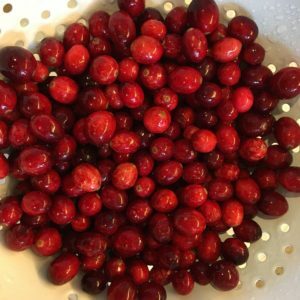 Even cranberries, tossed in a bowl or vase, can give you gorgeous Christmas color. 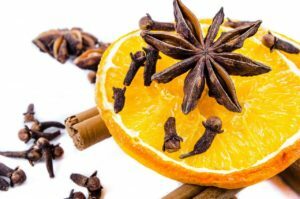 And spices can give you Christmas scent and shapes. These are just some of the unique natural décor ideas I love. I had so much fun imagining them and more in my Christmas Town story, Sleigh Bells in the Snow. My heroine, Scarlett Ray, owns a home décor shop called Hearth and Home. 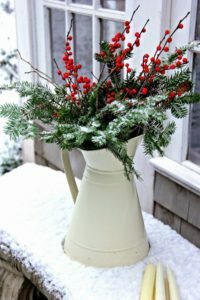 During the holidays she fills it with gorgeous and unique Christmas items to create a winter wonderland. And of course all of my favorite things are in her shop. I just wish I could jump into Christmas Town and visit!